The House and Senate have adjourned for their hardly earned annual five-week summer break, so it’s business as usual these lazy, crazy days of August in Washington with nothing of meaningful significance happening in the halls of Congress. One of the last things passed in the House last Friday was a record 40th anti-Obamacare vote (232 to 185) on a measure introduced by Tom Price (R-Georgia) charmingly entitled, “The Keep The IRS Off Your Health Care Act of 2013”— doomed to failure from the outset with a Democratic President and Senate fortunately in place. Price, a national Tea Party hero, has gone on record time and time again condemning “The Patient Protection and Affordable Health Care Act of 2010” as a “government takeover of health care”, a characterization as patently false as it is insipidly stupid. However, this qualifies Price to be often mentioned as a possible new House Speaker if John Boehner doesn’t talk the talk and walk the walk, trembling at every turn lest he upset Eric Cantor, Paul Ryan, Kevin McCarthy and other beneficiaries of rich, self-interested, ever wealthier campaign donors, the infamous Koch brothers coming quickest to mind. After 24 years in the Senate, Majority Leader Mitch McConnell (R-Kentucky) has become a multimillionaire — and not just for good looks. Dedicated to Barack Obama’s political destruction since the day our President took office, McConnell ironically now faces primary competition for his Senate seat in 2014 from even more conservative candidates pledged to out-hate Mitch at the drop of a hood. As with their previous 39 attempts to undermine the expressed will of the American people, our uptight right continues wasting time and talent in petulant pursuit of party purity. We can look for more of the same just down the road unless responsible GOP traditionalists can wrestle party control away from its wistfully wayward John Galt wannabes — dedicated do-nothings with dreams of an Ayn Randian inspired Utopia dancing through their heads like sugar plums on Christmas Eve. Then the righteous will answer him, “Lord, when did we see you hungry or thirsty and gave you something to drink? And when did we see you a stranger and invite you in or naked and clothe you? When did we see you sick or in prison and come to you?” The King will answer, “Truly I say to you, to the extent you did it to one of these brothers of Mine, even the least of them, you did it to me. Ultimately, it all comes down to caring and sharing. Godliness and selfishness are intrinsically oppositional. Let he or she who achieves material success enjoy first and foremost the fruits of their labor, yet remain ever thoughtful of those with less attained, especially children of poverty whose lot is surely not of their own design. When we elect folks to government who scorn the concept of social equity and a common good — government won’t work. It never has. It never will. This entry was posted on August 3, 2013 at 8:09 am and is filed under Uncategorized. You can follow any responses to this entry through the RSS 2.0 feed. You can leave a response, or trackback from your own site. Is it possible that the Bible, not patriotism is the last refuge of scoundrels? I rarely see it invoked when limousine liberals are touting abortion. And then we have the use of non sequiturs as a political rather than a literary device. What possible relevance can Rand’s purported worship of William Edward Hickman [who was convicted of one murder, hardly qualifying as a serial murderer] be? She considered using Hickman as a model for a character in a novel. There is no indication whatsoever that she was “heavily influenced” by him. And then of course the use of Rand’s sinister sounding Russian/Jewish birth name and then combining it with her atheism. Kind of reminiscent of folks who always refer to the president as Barack HUSSEIN Obama to attain the same effect. There is no doubt that both houses of our legislative branch are populated primarily by scoundrels. But let us not kid ourselves that Nancy and Harry and their minions are any less unworthy than the above named Republicans. I was quite surprised to discover the strong philosophical link between Rand and Hickman as I researched the subject. As well, although Hickman was only convicted once, one was all they needed to trip that trapdoor at San Quentin. Authorities at the time were thoroughly convinced there were at least SEVERAL more victims, another one of which Hickman confessed to prior to his execution. Rosenbaum’s name was her name. Your President saw no reason to change his. Ms. Rosenbaum’s (Ayn Rand) “core philosophy” is even worse than you quoted. She maintains that the only “valid” human expression is reason. Intuition, faith (and therefore religion) are automatically out. No matter that philosophers ever since Kant have looked at reason with suspicion, and even during the “Age of Reason” where philosophers were dazzled with Newton’s success in showing that the same laws govern heaven as govern earth (mathematics, or ‘reason’), reason was considered but one of many human expressions. You should know that most bona fide philosophers do not consider Ayn Rand to be a philosopher, mostly because of the arbitrary way she dismisses human expressions other than reason. This arbitrariness is more characteristically the modus operandi of a cultist, which most philosophers consider Ayn Rand to be. So, consider that in evaluating what Congressmen, or at least Tea Partiers, are. Indeed, like many immigrants, she did change her name when she reached to USA. Unlike many foreigners whose names were changed unilaterally at Ellis Island, she was able to pick a new surname; Rand, possibly as a Cyrillic contraction of her birth surname. Her adopted first name, Ayn could be a Finnish name or from the Hebrew word for eye. Do you really find anything insidious here? My president? Indeed he is, Peter C! He is the president of the United States. California still being at least a titular one, he is your president too! Charles, Charles, Charles. The characterization of Ms. Rosenbaum’s name as being “sinister sounding” is yours, not mine. Tsk.Tsk. I can’t imagine what’s wrong with you. Snap out of it. As for reference points, just Google or Bing. It’s all there, including Rosenbaum’s MUCH more than casual “appreciation” of Hickman. Hmmmmmmm. I notice curious phraseology in your observation — “she did change her name when she reached to USA.” Maybe better watch your English, Comrade. Da. Then why, Peter C, oh why would you make such a point of using Ms. Rand’s birth name when she was known for much her life by her adopted name? Come now, Peter C, to quote our fellow alumni Jim Clapp, don’t piss on my shoe and then try to tell me its raining! And then of course there is your very, very McCarthyistic pouncing upon my typing error. 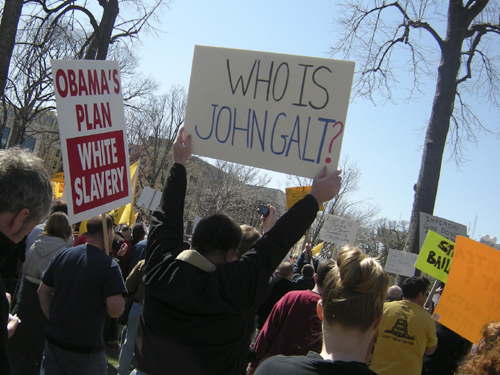 Do you have, right there in your pocket, a list of 59 atheist Tea Party libertarians who have read Atlas Shrugged? Or possibly your unrelenting emphasis on Rand’s birth name is some sort of subconscious literary doppelgänger for someone else who may or may not have used another name of another father at another time? And then, of course, there is the overarching issue of what the hell do Rand or Hickman have to do with the morons of all political stripes that populate Congress.